To the parents reading this, let's admit it - our kids want a signing board for their bar or bat mitzvah and we dutifully find a great picture or two, head to Kinko's or Staples and voila, we create one and it looks great. Signing boards are fun in the moment, no doubt about it. A beautiful, spirited photograph of the bar mitzvah boy or bat mitzvah girl in the center of a 18x24 board, with gushing well wishes from friends and family that are wonderful to read after the party is over. But then what? Where do you put these giant boards? I know that the three we have are somewhere in the basement collecting dust. A new alternative: Signing Books. What's a signing book? It's a horizontal 10x8 book with 20 pages. On each spread (two facing pages), one page has a photograph of the child and the other page is blank for signing. The surface of the paper is matte so that you can write on it, as opposed to on a glossy page which will smudge. 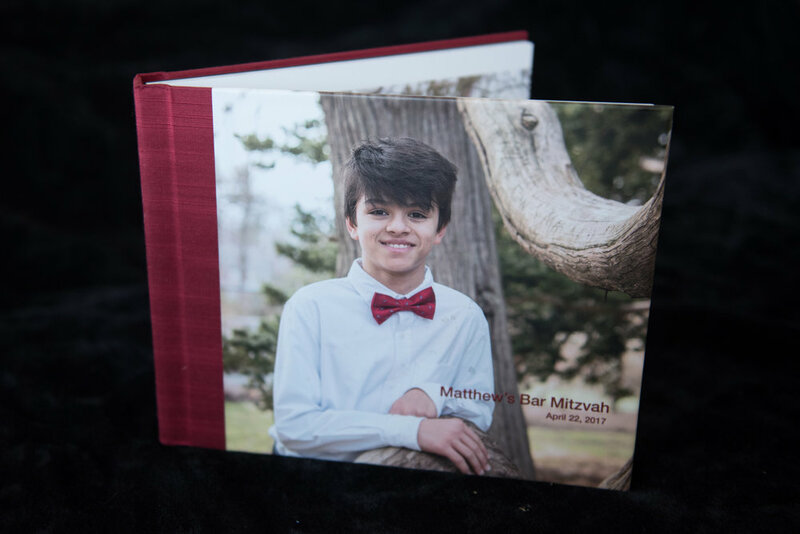 To create a signing book you can 1) Do-It-Yourself if you have high enough quality images of your son or daughter that the images can blow up to 8x10 without getting fuzzy and pixelated, or 2) bring in your bar/bat mitzvah photograph to do a one-hour photo shoot with your child (and the rest of the family) and choose the best 11 pictures from that (10 for the book, 1 for the cover, unless you want a fabric/leather cover). Such a shoot can be a wonderful opportunity to get great posed and candid shots of your 12-13 year old just being her or himself. We take so many pictures when our kids are young, and then that falls away and we're left with little documentation, besides generic school pictures, of them in these early teen years when they're emerging from childhood and finding out who they are. Let them pick their favorite outfit, a location they love, maybe an activity (soccer, dance) to include in a few of the images, bring in siblings, parents, and voila, you have a beautiful set of authentic pictures to cherish. At the party, the blank pages will be filled with words of love and friendship that your daughter or son can keep by the bed as a reminder of how much they're loved. In the case of the young man, above, he was a reluctant 'model.' He made his mom promise she'd never show the pictures to anyone. She hid the book until the party when she brought it out. When the party was over, he saw it, his eyes got wide and the biggest smile came across his face. "My book," he exclaimed, and grabbing it, he ran off to read all the words. I loved his unexpected excitement!! For Ela (below), who had a tropical beach theme at her February bat mitzvah, we headed to a beach in late August to get some shots of her and her sister and parents. As a photographer, specializing in bar and bat mitzvahs, the hour with the young man or woman is an incredible opportunity to create a bond, to help them relax in front of the camera, to build trust before their big day, and help me know how they look best. I LOVE, LOVE, LOVE providing the family with a joyous set of pictures. This past November, on one of the coldest days of the year, Lili and I headed to the West Hartford reservoir for a shoot. Her bat mitzvah theme for her spring bat mitzvah is travel so we brainstormed ideas and had a blast. Here's what we produced on an overcast gray day in the fading colors of autumn. Just as many weddings photographers include an engagement shoot as part of a wedding package, or an a la carte add-on, I have had a blast doing the same with my bar and bat mitzvah clients. Shana Sureck Photography, with studios in Hartford CT and Northampton MA, provides bar mitzvah photography, bat mitzvah photography, education photography, higher education photography, Jewish life cycle event photography, editorial photography, event photography, non profit photography, wedding photography.